In honor of posting my 300th recipe and reaching over 200 fans on my Facebook page, I am excited to announce my first-ever giveaway! Since I have never done this before, you will have to bear with me. Let's see if I can do it right! The giveaway is a one-year subscription to Taste of Home. I love Taste of Home and have found many great recipes in it. I love how their recipes aren't too fancy and tend to use a few simple ingredients to create a nice meal. To enter, leave a comment telling me what your favorite food magazine is. For a second entry, become a follower of this blog through Google Friend Connect (in the right sidebar). Leave a separate comment telling me you became a follower or are already following me. For a third entry, become a fan of my Facebook page. Leave a separate comment telling me you have done so. For a fourth entry, share the link to this giveaway on your Facebook page. 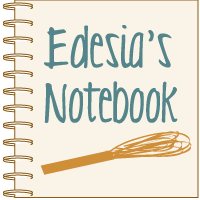 Please tag Edesia's Notebook in your post. Again, leave a separate comment telling me you have done so. That's four chances to win! The contest will be open until Tuesday, September 27 at 7:00 am Eastern. The winner will be chosen by Random.org. You can comment as "Anonymous", but you must include your name in your comment for it to be valid. Any Anonymous comments with no name will be deleted. Contest is open to U.S., Canadian, and International residents. This contest is not sponsored by Taste of Home or any other party; I am sponsoring this giveaway myself. 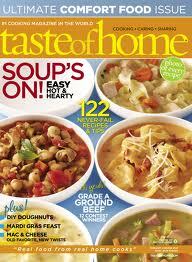 I love Taste of Home, it's probably my favorite food magazine, along w/ Food Network and Rachael Ray! I love Taste of Home! I get their annual cookbook every year! My favorite food magazine is Food Network Magazine, but it's the only one I subscribe to! and I'm already a fan of your blog! Good stuff found here! And I'm happy to share your giveaway on my FB page, now get back in the kitchen and share some more yummies with us! This is a great giveaway. My favorite food magazine is Gourmet but I also like Cooking Light and Food and Wine. Congrats on reaching 200 FB fans! A close second is "Everyday Food" (Martha!). **side bar** Lesa, I love reading your blog! Our family decided that we were going to do 5 weeks of new recipes and almost all of them came from your blog. Thanks for sharing such great, easy, DELICIOUS recipes. Can't wait to try some of your crock pot recipes (now, if I can just find my crock pot....). And I have shared the link to your giveaway! Thanks!! I also follow on googleconnect, come visit the Bread Fairy !!! I love Taste of Home! I'm also a subscriber! Thanks for all the great recipes and ideas! I love Taste of Home magazine!! I like the Food Network Magazine. It has a lot of different recipes and I like to see what the tv chefs are up to. My favorite magazine is Taste of Home! Well...it just so happens that i LOVE the Taste of home! I am going to 2, yes 2, of their shows next month!! I love the Taste of Home magazine--our Y gets it and I love to read it on the treadmill! I'm following you through Google too! (I think I got my four entries, lol)--great giveaway!! My favorite food mag would be a tie between Food Network Mag and Cooking Light. I am already a FB Fan! Thanks for linking up your giveaway at Freshmen Friday, Lesa!